Dr. Darko Kosanović, BS Phys. Chem. Darko Kosanović was born in Belgrade on May 10, 1982. He graduated from the Faculty of Physical Chemistry, University of Belgrade in 2009. The title of his graduation thesis was The Change of Densification Parameters and Microstruture durinf the Sintering of ZnO. He is a doctoral student at the Faculty of Technical Sciences in Čačak. He acquired his PhD degree at the same faculty in 2013. He was elected a Research Associate in 2014. Darko Kosanović has been working at the Institute since May 2010. Fields of interest: sintering, sintering kinetics, ceramic materials, electrical conductivity, characterization of materials, powder technology. He is a member of the Serbian Ceramic Society. 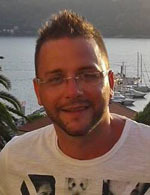 Dr Darko Kosanović is an Associate Editor of the journal Science of Sintering and a reviewer for this journal.